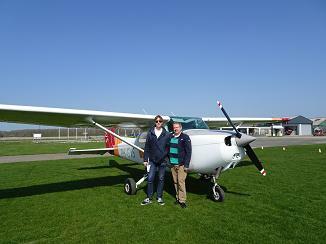 We had guests for a few days, and on Monday April 1st 2019 we were going to make a little flying trip from Hilversum. 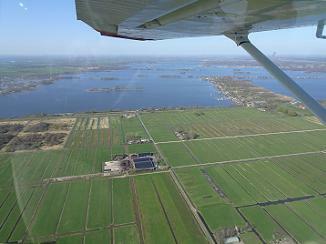 We discussed to fly over Amsterdam, and then to the north to the Islands, or to the south-west to Zeeland. On Monday morning we checked the Notams. 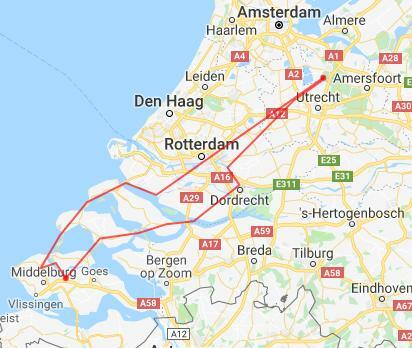 For Amsterdam there was a new Notam that said an online form had to be filled-in at least six hours in advance to enter the CTR, but we missed that the Notam start date was only the next day. We could have done the tour over Amsterdam. 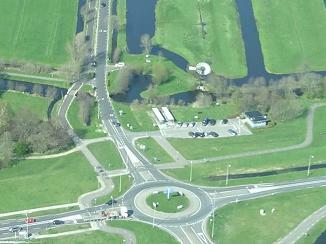 CROSSING VFR FLTS IN SCHIPHOL CTR 1, 2 AND 3 REQUIRE COORDINATION AT LEAST 6 HOURS IN ADVANCE. CONTACT OHD AT WWW.LVNL-OHD.NL AND FILL OUT AN ONLINE FORM. ADVICE TO STAY CLEAR OF SCHIPHOL CTR 1, 2 AND 3 DUE TO HIGH TRAFFIC DENSITY. HEMS, POLICE AND COASTGUARD ARE EXEMPTED. We drove to Hilversum airfield, and after fueling the plane we took-off from runway 13 to fly to the south-west in the direction of Zeeland. 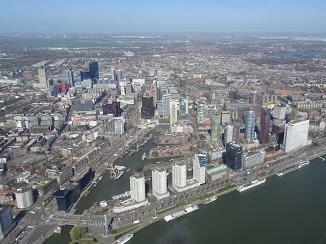 We crossed the Rotterdam CTR over the city to Spijkenisse, and from there further to the Haringvliet south of Voorne. Then we followed the Haringvliet waterline to the west, where we passed the Canal through Voorne and Hellevoetsluis. 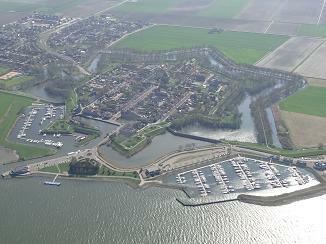 Hellevoetsluis is located on the Haringvliet, close to the broad Zeeland landscape. 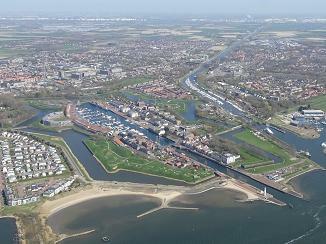 During the 17th and 18th century Hellevoetsluis was the naval port of the Admiralty of Rotterdam and could accommodate an entire fleet within a special land-enclosed fortress with harbour and dockyard facilities, accessible through a canal. Thanks to its strategic situation the town grew from the beginning of the 17th century to be the homeport for the Dutch war fleet. Because the mouth of the Meuse had been silted up considerably in the early 19th century, a Canal through Voorne was dug between Hellevoetsluis and the New Meuse, shortening the connection between Rotterdam and the sea. However, soon Ocean-going ships became too large to use the canal and the New Waterway was dug, making the Canal through Voorne redundant. 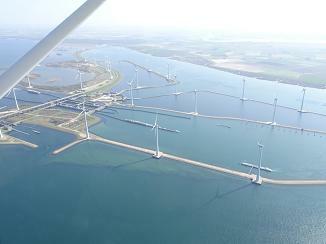 West of Hellevoetsluis is the Haringvlietdam. The Haringvliet sluices close off the estuary of the Haringvliet, and it was constructed as part of the Delta Works (see also this trip report). 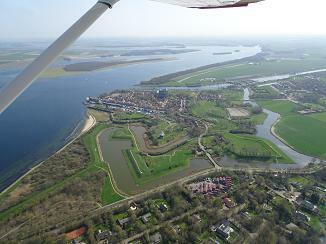 After passing Ouddorp on Goeree-Overflakkee we crossed the Grevelingenmeer to Schouwen-Duiveland. We passed Burgh-Haamstede, and had a good view on the Ringwalburg that stems from the Middle Ages. 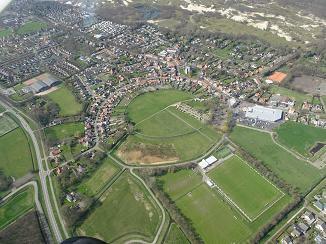 Zeeland had five circular fortifications. One is in Burgh. The defenses were erected in the 9th century, presumably by the local population under the leadership of ecclesiastical or wonderful rulers to defend themselves against attacks by the Vikings. However, newer investigations and reinterpretations of the archaeological sites in the Scheldt estuary overturned this understanding. Rather they should be understood as Viking Winter-camps erected in a hostile environment. 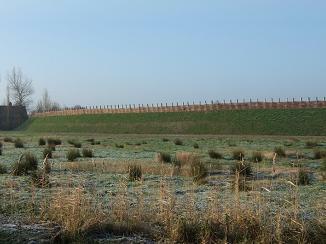 The ring fortress Burgh on Schouwen-Duiveland is an archaeological monument. 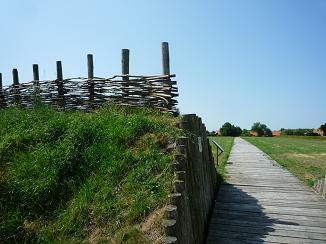 It is one of the best preserved Carolingian sites in the province of Zeeland. As part of a partial reconstruction, a quarter of the ring was raised and adorned with a willow wood palisade. A passage through the rampart was made in the place of one of the original four ports. The road cross is made visible through a log road. Visitors can walk along the rampart and log road. South of Burgh-Haamstede lies the Eastern Scheldt storm surge barrier or Oosterscheldekering between the islands Schouwen-Duiveland and North-Beveland. 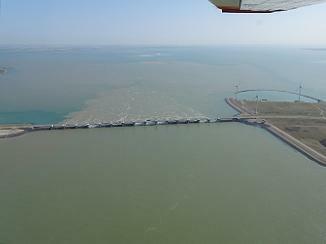 It is the longest dam in the Delta Works. 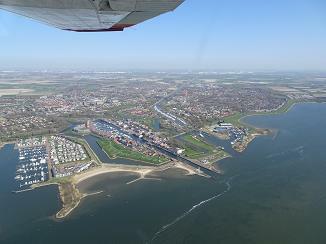 We flew along the Oosterscheldekering to the west of North-Beveland, and then to Walcheren. Walcheren is a former island. Municipalities are Middelburg, Vlissingen and Veere. 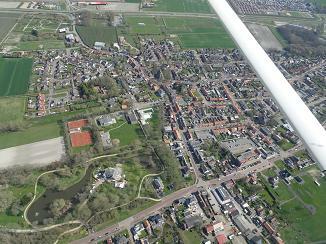 We first overflew the village of Serooskerke. 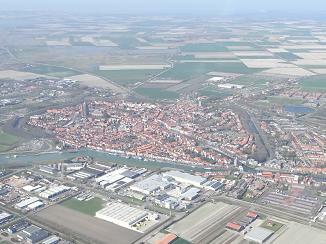 Serooskerke was a separate municipality until 1966, when it was merged with Veere. Serooskerke gained national fame in 1966, when a farmhand digging in a leek field found a gold coin. More than 1,000 were subsequently found, and the rest is history. The coins date back to the 16th and 17th centuries. 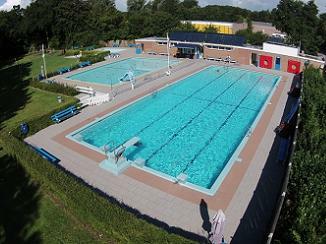 The municipality claimed half of the value and gave it a swimming pool De Goudvijver (The Gold Pond) in the village. 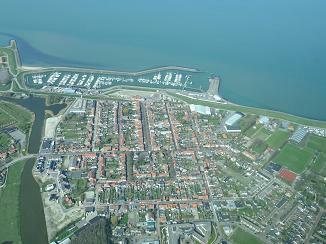 The island of Walcheren was the largest Dutch slaving center in the eighteenth century. It is estimated that around 1770 about a tenth of the income earned by inhabitants of Middelburg was connected to the trade in enslaved Africans. For the more specialized and smaller city of Flushing (Vlissingen), this figure was likely closer to a third of all income. From 1732-1807, the Middelburgse Commercie Compagnie (MCC) bought 31.095 enslaved African people, with the intention of selling them in the West Indies. In Africa, the MCC traded goods for enslaved people. These people were then transported across the Atlantic Ocean and sold to merchants and plantation owners. 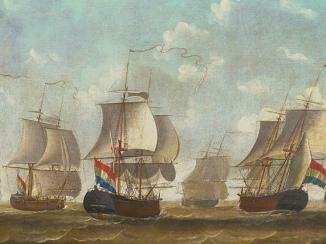 With the proceeds in coins, sugar, tobacco or cocoa, the ships would sail back to Zeeland. This form of trade in enslaved people is called Trans-Atlantic slave trade or triangular trade. Except for the Compagnie, illegal slave traders were also operating from Zeeland. The archive of the MCC is kept by the Zeeland Archives and is included on UNESCO�s World Heritage List. 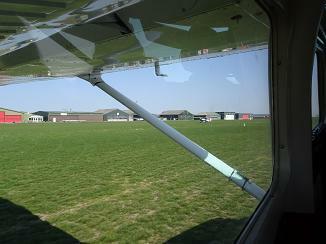 After Serooskerke we flew around Veere. 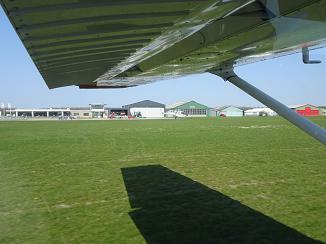 South-east of Veere is the Midden Zeeland airfield. We landed there and had lunch. In 1541 the Scottish king Jacob V, appointed Veere as Scottish trading staple of the Low Countries. This meant that every product that was shipped from Scotland to Europe, first had to be stored in Veere for a while. In order to store all goods, warehouses were built near the harbor area. A part of the quay was specifically reserved for the ships from Scotland, in time this became known as the Scottish Quay (Schotse Kaai). Furthermore, merchants would built beautiful houses here. Not only Scottish merchants and their families settled in Zeeland. Several so-called peace garrisons were stationed in the Netherlands, some Scottish soldiers were part of this organization. The soldiers were housed in several different barracks in the city. They often brought along their children and wives, who would settle in Veere as well as in other cities. Others would marry Dutch women during their service and would then settle in one of the Dutch cities. Many Dutch citizens with Scottish ancestors are descendants of these soldiers. In 1860 the descendants of the Scottish still lived in Veere, however throughout the years these settlers have all moved away to other places as well. You can no longer find Scottish names in Veere. After lunch we walked back to the plane for the return flight to Hilversum. 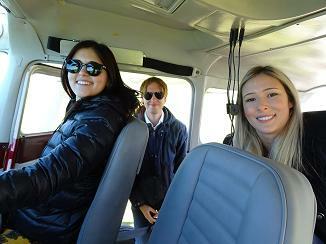 We made some pictures with the plane, checked the oil, and then we went on our way. Soon after departure we passed Kortgene and Wolphaartsdijk, followed by Colijnsplaat on the north of North-Beveland. Kortgene is a village on North-Beveland. It received city rights in 1431. In the 1600s, a flood destroyed Kortgene. In the late 17th century, the village reclaimed the land and had a church once more. The 15th century church tower is now the oldest monument on North-Beveland. The German occupying army confiscated the church bells, called "Suzanne", in World War II. The bells were returned to the church after the war. The Kortgene church was the only one on North-Beveland to ring its old bells again. Across the Veerse Meer on South-Beveland lies Wolphaartsdijk. Originally Wolphaartsdijk was an island in the Middle Ages. Oosterkerke was one of three villages on the island. After massive floods in the 13th century, what remained was called Oosterland. The name devolved back to Oosterkerke over time. Since the town had long been more known as Wolphaartsdijk, the name was officialy changed in 1960. Wolphaartsdijk was also hit by the North Sea flood of 1953. Colijnsplaat is an old village, created when the old North-Beveland polder was reclaimed in 1598. The "Colinsplate" salt marsh was partly closed off by dikes, from which the town received its name. 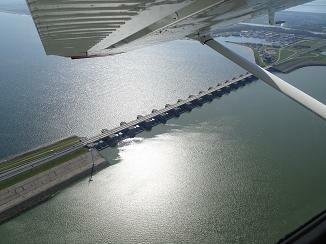 We crossed the Oosterschelde along the Zeeland-bridge to the north. On the other side of the bridge lies Zierikzee. It is the largest village in Schouwen-Duiveland. It was settled in the Middle Ages and retains a number of buildings dating from this time, including De Dikke Toren. The 16th century Town Hall houses the Stadhuis Museum. After Zierikzee we continued to the east side of Schouwen-Duiveland island, and then over the Grevelingendam and Philipsdam to the island Goeree-Overflakkee. 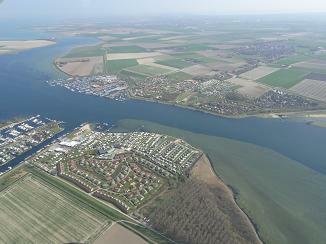 The Grevelingendam and the Philipsdam separates the brackish water of the Oosterschelde in the south-west from the freshwater of the Volkerak in the north-east. Over Goeree-Overflakkee we passed Oude-Tonge, followed by Ooltgensplaat on the east side of the island. From there we passed the Hellegatsdam and the Volkerakdam, and then we flew along Willemstad to have a view on the old town. Willemstad is a small historical town with well preserved fortifications. Willemstad was one of Prince William of Orange's most strategically located fortresses. It lies on the Hollands Diep, and it received city rights in 1585. The Reformed Church was built in 1607 as the first new Protestant church building in the Netherlands. We then continued to Dordrecht to have a view on the old town. 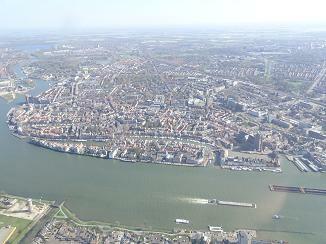 Dordrecht is considered to be the oldest city in Holland (the provinces of North-Holland and South-Holland). 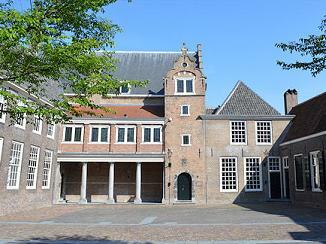 Dordrecht is the oldest city in Holland and has a rich history and culture. The city was formed along the Thure river, in the midst of peat swamps. The settlement was located at the place where broad sea currents met inland waters, the place where sea captains had to transfer their cargo from their sea-going vessels to inland boats. The count of Holland realized the importance of the new settlement's location and made Dordrecht the centre of his toll collection system. As early as 1262 the coins for the county of Holland were minted in Dordrecht. 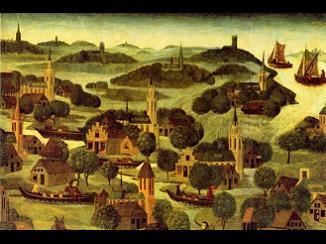 Dordrecht lost its prominent role in the night of 18th November 1421. 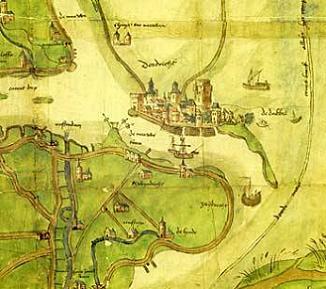 The Saint Elisabeth's flood flooded large parts of southern Holland, causing Dordrecht to become an island, depriving Dordrecht of its hinterland and therefore its trade, of its farmland and of its opportunities to expand. Boats began to literally 'sail round' the city's right to levy staple duty. In 1572, representatives of all the cities of Holland, with the exception of Amsterdam, as well as the Watergeuzen, gathered in Dordrecht to hold the first Assembly of the Free States, also known as the Union of Dordrecht. This started a free and independent Republic of the Netherlands. Philip II of Spain was unanimously denounced, and William of Orange was put at the head of the revolt against Spain. 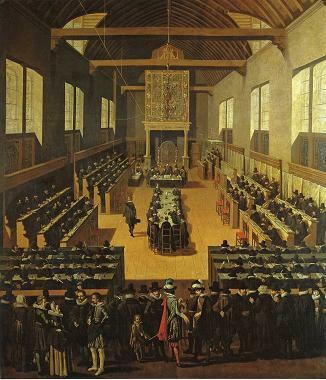 In 1618-1619 the Synod of Dordrecht took place in Dordrecht, stronghold of the Reformation and the place where the Remonstrants stood opposite the Contra-Remonstrants. The in essence theological conflict between different factions of the church had in practice spilled over into politics. Following the Synod, two hundred Remonstrant ministers were deposed from their office, of which eighty were banished. The political leaders of the Remonstrant movement were arrested. Johan van Oldenbarnevelt was beheaded on May 13, 1619. Hugo Grotius was given a life sentence in prison, but escaped in 1621. From the 18th century on, Dordrecht became outflanked by Rotterdam. 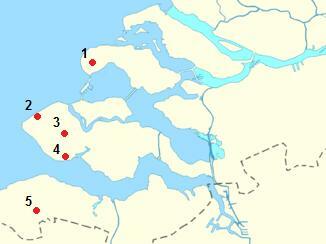 Through the centuries Dordrecht held a key position in the defence of Holland. It hosted an army division well into the 20th century. 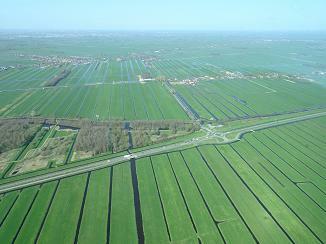 After Dordrecht we turned to the north-west, to Kinderdijk north of Alblasserdam. The Mill Network at Kinderdijk was built around 1740 to drain the Alblasserwaard polder at the confluence of the Lek and Noord rivers. 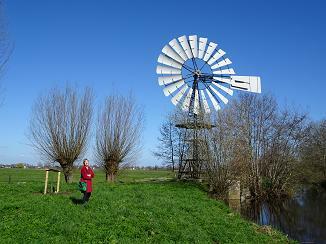 It is the largest concentration of old windmills in the Netherlands. 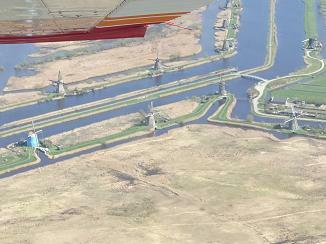 We then headed to the Krimpenerwaard, where we made a pass over the American wind engine near Zuidbroek. 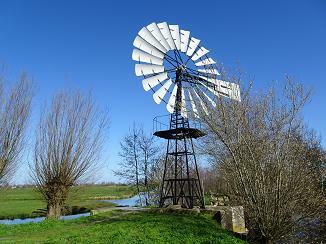 The American wind engine or roosmolen is a type of windmill with many blades and can be seen as a successor to the classic types of Dutch wind and water mills. 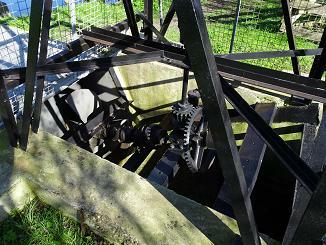 This type of mill was often used in the Netherlands in the first half of the 20th century for pumping smaller polders. The Zuidbroekse Molen was installed in 1922 near Zuidbroek in the province South Holland, and the last remaining mill of this type in South Holland. In 1984 the Zuidbroekse Molen was designated as a protected provincial monument. We continued our flight back to Hilversum. We first made an orbit over Castle De Haar. 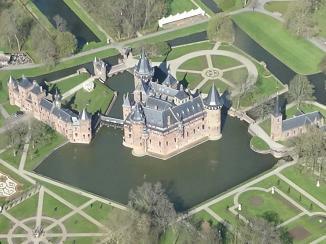 Castle De Haar is the largest castle of Holland and is located just outside Utrecht. Castle De Haar may look Medieval, but was actually built in the early twentieth century. 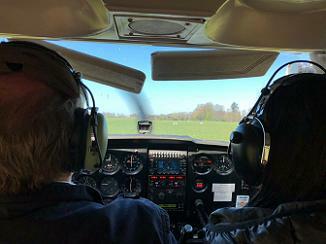 Near the Loosdrechtse Plassen we approached Hilversum airfield, where runway 13 was in use. After landing we parked the plane, finished the paperwork and then we went home.